Known to be the best AI Selfie and entertainment smartphone in Malaysia, the HUAWEI nova 4 will be available for pre-orders at an attractive price of RM1,899, from 8th February 2019 till 13th February 2019. Just in time for Valentine’s Day! ALL you have to do is head on over to any HUAWEI Experience Store and present a deposit of only RM200 to secure your unit. You will then have to pay the remaining RM1,699 when you pick up your unit on 14th February 2019. More of an online shopping fan? Fret not as you can also pre-order via the HUAWEI Official Online Store by making a full payment of RM1,899, and receive an additional voucher worth RM50 which can be used at the Online Store. But wait, there’s more! While all purchases of the HUAWEI nova 4 comes with a FREE Bluetooth headset, every pre-order made will also include a Premium Gift Pack*. In total, you stand to receive value-for-money freebies worth up to RM400. The HUAWEI nova 4 sports a new generation 6.4-inch Punch FullView display, taking bezel-less displays a level higher for a truly natural and stunning viewing experience. Coupled with AI Beautification, its 25MP front camera allows you to take the perfect selfies. The HUAWEI nova 4 is equipped with Triple AI Cameras on the rear, featuring a high resolution 20MP primary camera, a 16MP ultra wide angle camera and a 2MP bokeh lens. These make the HUAWEI nova 4 the perfect device for capturing endless plains or sprawling metropolis that stretch towards the horizon. Smartphone users are continuously looking for distinctive features and options; the HUAWEI nova 4 can offer just that. With its video ringtone capabilities, there are endless possibilities for you to get creative when someone calls – all the way from celebrity TikTok videos, comedies, and dance offs. Additionally, the HUAWEI nova 4 fully utilises the hardware processing power and AI computation capacity of Kirin 970’s NPU to deliver powerful and smart AI video editing experiences. Trained with 60,000 basic models as well as one million facial models generated through AI facial recognition, the feature can automatically process and edit footage. What would have taken a great deal of time can now be done in mere minutes. 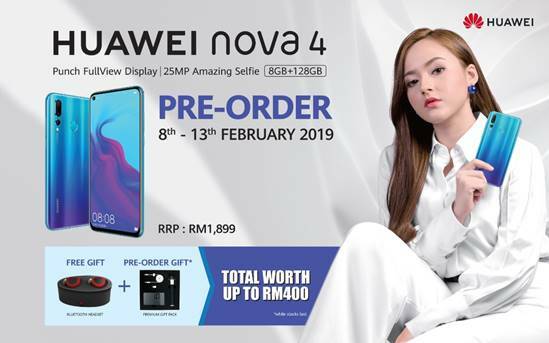 In conjunction with the official sales launch of the HUAWEI nova 4 on 14th February 2019, HUAWEI Malaysia will be hosting the Amazing nova Search – one of Malaysia’s largest and adrenalin-packed treasure hunts – where you can win 1 unit of the HUAWEI nova 4. Taking place in selected locations around the nation, the race will be on to see who can be the fastest and most resourceful. There will be a total of 51 units to be won, so stay tuned for more information! Made available in Malaysia starting 14th February 2019, the HUAWEI nova 4 will retail at a price of RM1,899 and can be purchased at all HUAWEI Experience Stores, display zones, authorised dealers, major telco companies, and the HUAWEI Official Online Store. It is available in two fashionable colorways: Crush Blue evokes a sense of mystery with a tinge of romance; and the Black exudes understated class.